View of Stonehenge in Wiltshire, taken by the Ordnance Survey under the supervision of Colonel Sir Henry James. 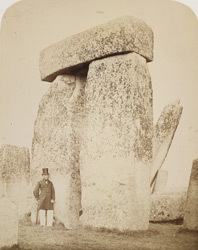 The image is one of eight photographs of the monument illustrating Colonel James’ 1867 book ‘Stonehenge, Turusachan and Cromlechs’, and was published as plate 5. Five pairs of 'stupendously large' trilithons or stones surmounted by lintels originally stood in the centre of the stone circle, and this view includes a portrait of James in frock coat and top standing next to the trilithon to the left of the altar stone, with a leaning megalith beyond. He wrote: “The stones in the uprights have each two tenons in their upper surfaces, which fit into mortices cut into the under surface of the horizontal stones, by this mode of construction the whole circle was braced together…they have all been roughly squared and dressed, especially at the joints between the lintels and uprights where the surfaces have been truly worked…”. James (1803-1877) served as Director-General of the Ordnance Survey between 1854 and 1875. He was quick to understand how the new technology of photography could be applied to its operations, in particular how maps could be enlarged or reduced in scale, and set up the first photography studio in the Survey office at Southampton. He is associated with the invention of zincography (though in fact it had been developed by two of his staff), a quick and cheap photomechanical printing process which contributed to the completion of the survey of Britain in 1870.